Wolfspeed, LED products and lighting products are the major three segments of Cree’s operation. The Wolfspeed segment covers products of silicon carbide (SiC) and gallium nitride (GaN) materials, and power devices and RF devices based on silicon (Si) and wide bandgap semiconductor materials. The LED products segment includes LED chips and components and the lighting products segment‘s products consist of LED lighting system and lamps. For the fourth quarter of fiscal 2018, the revenue of Wolfspeed was US$ 110 million, accounting for 26.9%, up by 81% YoY. 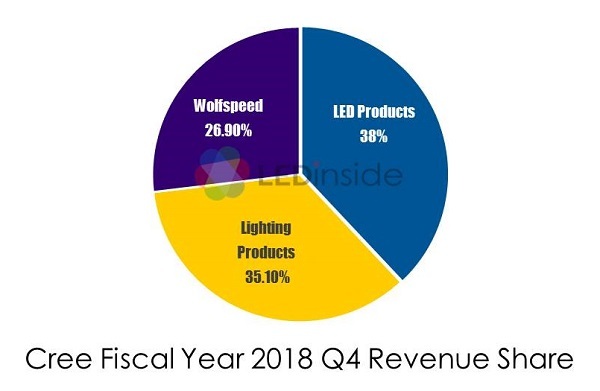 LED products revenue was US$155.8 million, accounting for 38%, up by 9% YoY while lighting products dropped by 7% YoY to US$144 million, accounting for 35.1%. CEO of Cree, Gregg Lowe, said “Fiscal year 2018 finished with good momentum, with fourth quarter non-GAAP earnings per share that exceeded the top end of our range driven by Wolfspeed growth and gross margin improvement. The demand for Silicon Carbide and GaN technologies continues to grow, as evidenced by the excellent results of our Wolfspeed business. We are expanding our manufacturing footprint and broadening our product portfolio to extend our leadership position in this market and drive growth." For the outlook of the first quarter of fiscal 2019 which will end September 23, 2018, Cree targets a revenue of US$395 - $415 million.